Galveston surf is usually knee to waist high, with some head high days in the mix, especially at the Flagship Hotel. Please note that the Flagship is now called something else but still known as the Flagship, and it will be called Flagship on this website. However, it isn’t difficult to find and we’ll include a picture for you. The first spot on the Galveston surf map above is East Beach. This beach gets a little crazy sometimes and there are some great parties out here. The annual sand castle contest is also held here, which is a lot of fun. Beer + tons of awesome sand castles; can’t beat that. Technically we’re not allowed to surf out here anymore, but during the best surf season, winter, there are no life guards on duty, so surf away. The only reason surfing is ever off limits is because of the crowds that gather in the water; they don’t want anyone getting knocked out by a surfboard. Surf at East Beach is usually really choppy. The Flagship Hotel has the best surf in Galveston, without a doubt. It’s also the most crowded surf spot and the easiest to find. 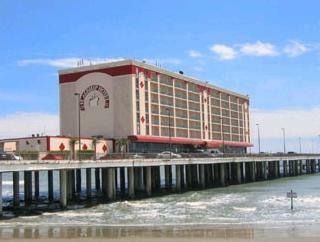 Surf is usually best on the west side of the hotel, which is built on a cement pier (see picture above). To know which side to surf on – east or west – just watch the other surfers. Wherever they’re having the most fun, that’s where you should surf, assuming you’re not brand new to the sport. If you’re brand new to surfing, you should practice on the opposite side, that is, the side with the least surfers. You don’t want to get in everyones’ way and cause a safety hazard. To find the Flagship Hotel, you’ll want to turn down 61st Street as soon as you get over the causeway that leads to Galveston Island. Head down to the end of 61st Street, which deadends into the Gulf, and hang a left. Drive until you see the big hotel that’s hovering over the water, and park. The surf at 61st Street is a lot of fun, and you make the shortest drive to get to it if you’re coming from the causeway. Park, get out, and surf. Pocket beaches are little beaches that have small entrances, and the whole beach is relatively small compared to other beaches. These are mostly used by the homeowners that leave on either side of them, and by the hotels and condos that are placed beside them. They offer a lot of privacy and you’re likely to be the only surfer in the water if you surf at a pocket beach. There are no lifeguards on duty and often there isn’t even anyone else at the beach at all. Surf isn’t the best at these spots, but they’re the perfect spots for learning, as long as you go with someone who can save your life if it’s necessary. You’ll want to paddle out to the second, if not the third, sandbar. Note: One of the guys from Endless Summer 2 told me that the sharks like to roam around between the second and third sandbars. Warning: San Luis Pass is known to have killer tides and sharks. San Luis Pass is about a 30 minute drive from 61st street, but if you gotta get wet and there’s no surf anywhere else, drive out this way. You don’t want to go over the toll bridge. If you see the sign that says Toll Bridge Ahead, turn around and look for an entrance to a beach. There’s a long beach out there that has some large homes on either side of it. Surf there can get really nice, although it’s usually choppy.